After weeks of rumors, speculation and denials, Brian Stann finally has an opponent for UFC 130. The former Marine officer will be fighting Jorge Santiago on May 28 in Las Vegas. Stann had initially requested a fight with legendary Pride fighter Wanderlei Silva, and it appeared that the UFC had signed off on the matchup. But Silva balked at fighting Stann, and it now sounds like he simply isn’t healthy enough to fight following knee surgery earlier this year. Stann is fresh off the biggest win of his career at UFC 125, where he stopped Chris Leben in the first round with a flurry of strikes. 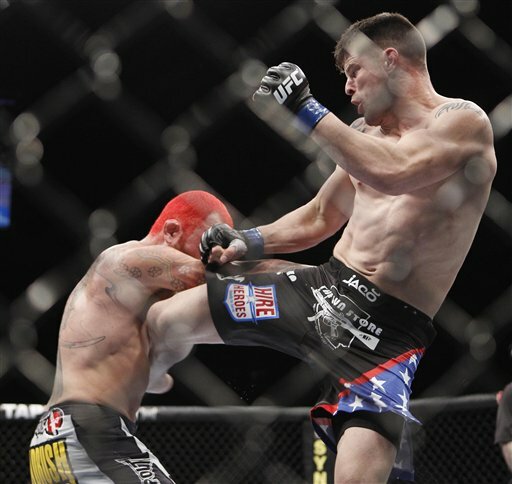 The Silver Star recipient is 2-0 in the UFC since making the move from the light heavyweight division, and the Leben victory has propelled him into a potential title contender in the 185-pound weight class. Santiago, 30, is 11-1 since leaving the UFC in 2006 after two consecutive losses by knockout. He returns to the UFC after a stint in Japan’s Sengoku organazation, where the 185 pounder was the middleweight champ. Well done Stan, Keep it up! !